I WANT TO SEND A HUGE THANK YOU TO GREG SELLERS AND THE GREAT FOLKS AT MOTOR TABS. AS PART OF OUR SPONSORSHIP AGREEMENT MOTOR TABS WILL BE SUPPLYING ME THROUGH THE END OF 2008 AND THEN STARTING A FRESH YEAR IN 2009. I use Motor Tabs because of their portability, electrolyte content and their taste. 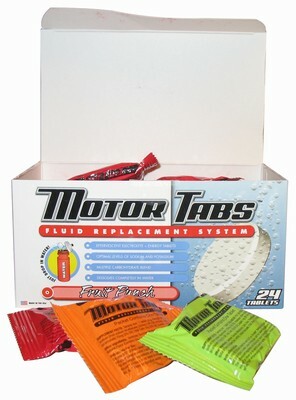 Visit their website at www.motortabs.com and read all about them. They are a great way to add flavor and carbonation to your favorite plain bland tasting powder nutrition. I use it with Carbo-Pro which is a non-sweet Maltodextrin powder. I get the carbs from the Carbo-Pro and the electrolytes from the Motor Tabs. IT IS AN EXCELLENT COMBINATION. THANKS AGAIN GREG AND MOTOR TABS. This entry was posted in Sponsors by REV Cycling Directeur Sportif. Bookmark the permalink.